How does fibromyalgia affect the lymphatic system? Chronic pain management techniques are called for when lymphatic stagnation exacerbates our fibromyalgia pain. We like to focus on the less invasive remedies for any lymphatic involvement, because if you are living with fibromyalgia, you already have enough side effects from the condition itself. When pain, tension and stagnation of any kind take place in the body, every system is affected; this is often where diseases of various kinds begin to manifest in the body. With a complex illness such as fibromyalgia and the propensity to multiple TRP's (trigger points), the body becomes more vulnerable to a 'dysfunction' in the circulatory and lymphatic systems. However, the circulatory system has a somewhat greater ability to regulate itself (through the heart) whereas the lymphatic system needs more support without a "pumping station" of its own. The many lymph nodes within our body are designed to protect our immune system and well-being. Yet without consistent force exerted on the lymphatic system, this constant stagnation can lead to or exacerbate illness…everything from fibromyalgia and chronic fatigue to cancer. Just like our bones, our lymphatic system needs a healthy amount of force to keep our immune system healthy and free of accumulating excess toxins. It has been found that lymphatic congestion is more likely to occur around TRP (trigger point) areas of the fibro body. This is due to the constriction, tension and radiating pain within these TRP’s. Lymphatic congestion can also be the result of a poor diet, insufficient exercise and dysfunction within the liver and bile ducts. This congestion leads to increased pain, fatigue, water retention, and fat pockets on the body. Sounds like a good idea to keep those lymphatic juices flowing properly, right? Trigger points themselves can also cause lymphatic constriction in and around many sensitive areas of the body. And, many people with fibro have multiple trigger point areas on the body, making way for increased propensity for lymphatic stagnation, more symptoms and greater risk for all disease. If you haven't already, read more here about fibromyalgia Trigger Points. A common area of lymphatic congestion for women is around the breast and pelvic area where many lymph nodes are located. This can be of special concern for women with fibromyalgia because of a greater propensity for FBD, or Fibrocystic Breast Disease. Although not life threatening, FBD can cause severe pain for weeks and months at a time with stabbing pain and increased pain during movement involving the breast area. Also, due to the fact that lymphatic flow is constricted, this can be of greater concern in the prevention of breast and other cancers. This fibrocystic breast pain might even deter a woman from working out due to movement and pain during exercise, and yet that is exactly what is needed to get the lymphatic system flowing properly. Let’s review some effective ways to counteract lymphatic congestion, some you may already be utilizing and maybe some you may want to add as greater prevention in your heal-thy lifestyle. A healthy lymphatic system will aid in natural detoxing of the body and assist in regeneration as well. What about the interstitial fluid? You may have heard about the interstitium of the body. This is basically referring to the interstitial fluid surrounding tissue and cells in the body. What we know is that it is not inside the cell but rather outside in a fluid that contains everything from water, carbon dioxide, salt and even hormones. We actually have over twice as much interstitial fluid in our bodies than we do blood. We have about 5 liters of blood, yet 11 liters of interstitial fluids. Can this be influenced by the lymphatic system? We believe it can. Although separate, these systems support each other. When the lymphatic system is overloaded and unable to do its job, this can cause excess fluid around tissues, extracellular areas, and even correlate with myofascial pain and trigger points we so often talk about. Exercise is going to be number one when it comes to keeping the lymphatic system healthy and moving. As a fellow fibro and as a trainer specializing in fibromyalgia, I surely get it and that is why I do this. I always offer modifications that are also effective. When starting any fibromyalgia fitness plan, it becomes more about preparing the body, keeping it safe and effective and applying techniques to lessen post exercise malaise and stay consistent. On the fitness page, Fibro Fit People, on facebook, I perform a lot of tapping lymphatic type exercises that are very gentle yet effective. Watch my video below where I show some techniques for movements on the rebounder. Much safer for joint issues. 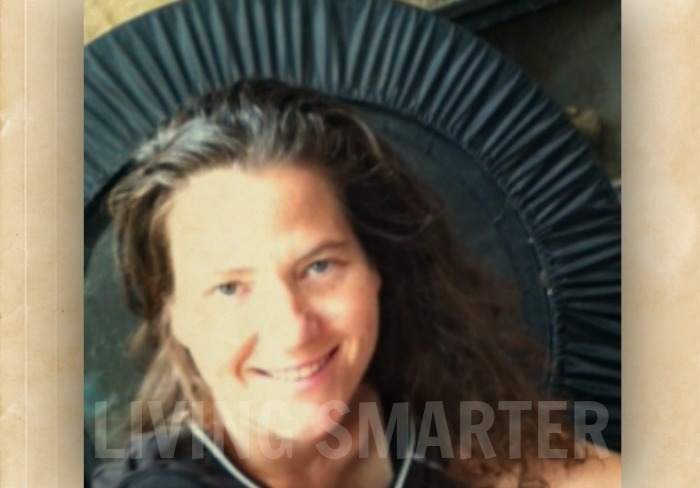 Rebounding through the use of a small trampoline (in background) is very effective in getting the lymphatic system moving through force exerted on the lymph nodes. Just 5-10 minutes per day is sufficient, starting with 1-2 minutes. The link above shows many rebounders, but quality is essential. If a rebounder is not available or you cannot perform even light jumping, a large exercise ball can be used. Simply sit on the ball and gently bounce, using mostly the upper body with feet on the floor. I show this in the video section of Fibro Fit People. Yes, watch my video, it is extremely effective!! You brush you hair every day, right? What about your skin? Skin brushing activates the lymphatic system through the stimulating touch to the skin. A brush designed specifically for gentle skin brushing or even a loofah type sponge can be used effectively. Skin brushing is best done before applying lotion to the body. The lymphatic system is intimately involved with the function of the liver, gallbladder and bile ducts. Diseases of the liver and gallbladder have been on the rise in recent years often as a result of years of poor diet and lifestyle habits. When there is stagnation within the liver and bile ducts, this produces congestion within the lymphatic system and the body’s ability to properly cleanse waste materials from the body. Adhering to an anti-inflammatory diet is the best way to prevent and treat liver dysfunction and inflamed bile ducts. Often doctors take out the gallbladder on a patient presenting symptoms yet the underlying cause is often inflammation within the bile ducts. WHAT ABOUT HERBAL SUPPORT ? There are a few herbal remedies that can support the lymphatic system. 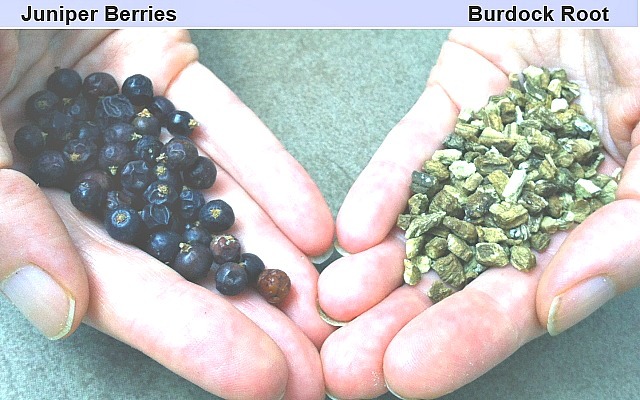 Two of my favorite herbs for cleansing the body and lymphatic system are burdock root and juniper berries. Both are great detoxifiers for the body. Organic Juniper Berries are excellent for both the lymphatic and the urinary system. Chronic pain management in fibromyalgia needs to always address the elimination systems of the body ..
Burdock root is used for gently and effectively 'detoxing' the body. Also great for purification of the skin. These herbs can be found in organic dry form in bulk herbal departments of health food stores or online and are very cost effective. The herbs can be used to make tea, and this is also the most cost effective way to utilize these herbs. About 2 Tbsp. of each added to a pint of water and simmer in a small pot for 10 minutes, then let sit and steep before pouring your tea. NOTE: water can be added back to pot and used one additional time. Add any other herbs of synergistic quality as well ..
Another great tool that can be especially beneficial for the sensitive fibro body is lymphatic massage. The great thing about this type of massage is that it is very gentle and light without the need for too much applied pressure. Too much pressure should never be applied with lymphatic massage, more of a ‘sweeping’ motion, very similar to the afore-mentioned skin brushing technique. If you’ve got fibromyalgia, you will benefit greatly from keeping those lymphatic juices flowing !! As with every other chronic pain management tool we use here, consistency is the key to getting better results while reducing levels of pain, stagnation and overall symptoms. Keep working at it. Lisa.